Once upon a time, I was really good at doing all sorts of mum stuff. Yep, I was organised and structured and full of all of that bubbly enthusiasm new mums have by the bucket load. It's funny how that enthusiasm wanes. Not that I love them any less or that they aren't still the most precious things in the world to me... no they are all that and then some. It's just that there must have been a hole in the bucket because looking back - I can see how I have ummm relaxed a little between child number one and child number three. Shall I be more specific? With my first son, I was so enthusiastic about ... well everything really. I snipped locks of hair and lovingly stuck them in his memory book and wrote page upon page of reflection and firsts moments. I took photos, like real photos that you had to get printed at a photo shop and everything, and then I carefully laid them out in photo albums with dates and captions penned in sweetly coloured ink. I organised play dates. Proper play dates where I sat and drank coffee with the visiting child's mum and I baked and made some of those virtuous look at me I'm a wholesome mum kind of snacks for the kids to eat too. I carried spare clothes for my son in my huge carry all along with bottles of chilled water and little containers full of sultanas and cheese nibbles. I even carried a plastic snap log bag of Cheerios for crying out loud. My first son's outfits were colour coordinated and his lunch box matched his kindy back pack AND his library bag. Everything was labelled and I knew exactly how many match box cars we came with and we had them all accounted for before we left anywhere. At a whiff of a sniff he was at the doctors getting checked out and when he wasn't unwell we took leisurely strolls where we collected leaves and sticks and other bits of nature that sat in a basket by the front door because I couldn't bear to part with something that was a reminder of precious time I had spent with my son. He was tucked up in bed at the same time, every night, teeth brushed for two whole minutes and bed covers tucked in snugly before story time. Oh man how times have changed. These days they are lucky to get a hair cut twice a year and there are no locks saved for memory books because they fight the whole freaking time about not cutting too much off. As for memory books for the younger two kids... let's just say the dog ate them shall we? The computer is full of photos of the younger boys, some of which I have actually printed out on to real paper and stuff for the purpose of displaying them. But as for carefully collated photo albums ... do they still make them? My youngest who is 8 informed me the other day that he has had "like only two play dates ever" in his whole life. They have each other and besides, I have enough trouble keeping them from hurting themselves let alone being responsible for keeping someone else's precious flesh and blood safe. Wait, here's an idea kids - try playing together instead of fighting with each other. You have real life live in playmates if you hadn't noticed. As for spare clothes - they are lucky if they are in clean clothes let alone having spare ones because ALL of their clothes are on their bedroom floor and under the bed, and it is a day totally worth celebrating if we manage to find matching socks that don't have any life threatening knobbly bits in the toes. Water bottles are for wusses. Don't you know that there are kids in the world that don't even have clean water? Find a tap, use your hands... I can't remember to bring everything! "You want a snack? You're hungry AGAIN? " "Didn't I just feed you last night? Check my bag, if you are lucky you might find a month old mangy pack of mentos in my hand bag... but I'm not making any promises and NO we can't afford to buy cheerios any more!" If you can find something with matching grass stains and coordinating paint splatters then by all means - feel free to coordinate yourselves. Oh and as for matching lunchboxes my dear precious children - you could have matching lunch boxes if you managed to find any of the 47 you have unfortunately misplaced over the past few years. You lost a matchbox car did you snookums? NO IT WAS CONFISCATED because you were being a turd and threw it at your brother's head. Are you missing a limb? Is your finger hanging by a thread? Are you too sick for Maccas? Then you'll be fine and for God's sake can you STOP leaving piles of leaves and sticks and other crap by the front door! Ahhh bedtime... this is one thing that hasn't changed. I still keep my eye on the time although these days it's because I am positively counting minutes until they go to bed, so much so that there are times that I have told them to "forget cleaning your teeth tonight.. just go to bloody bed already!" I still like to tuck them in though... niiiiiice and TIGHT. The bed time stories have advanced with their maturity and they now include plot lines where the little boy gets gobbled up by a three headed dragon because he kept getting out of bed. The sooner that Cotton on Kids comes up with some coordinated fitted sheets and Velcro straps, the better. Yep times sure have changed. Sorry, it's been a big week. I'll be nicer next week and back to attempting wholesome snacks and trying to be virtuous ... maybe. 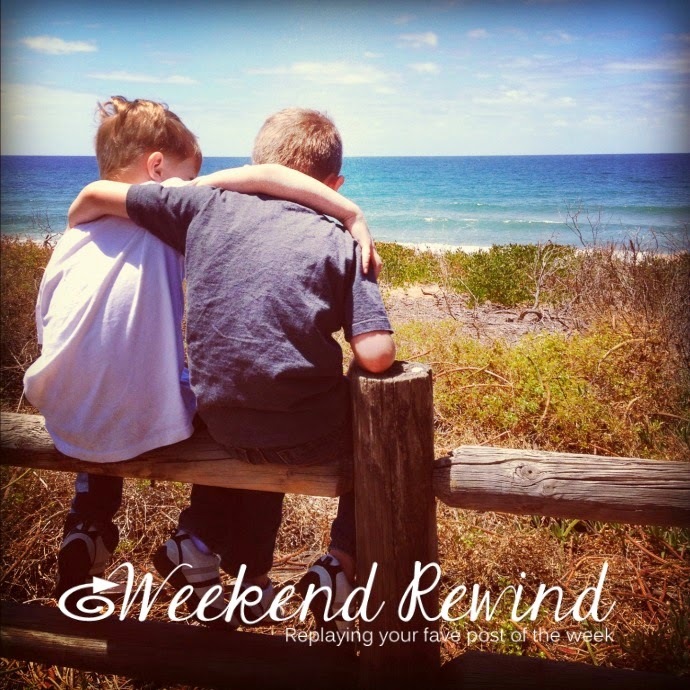 In the meantime, meet someone who is probably a zillion times more cheery than I am today - Meet Em, our gorgeous guest host of this week's Weekend Rewind. 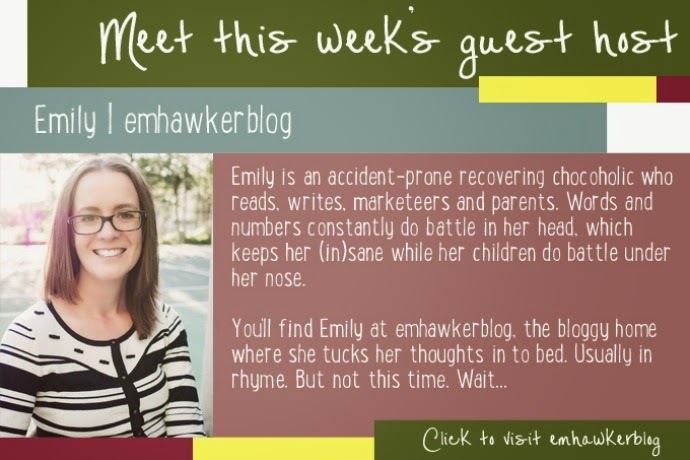 Emily is an accident-prone recovering chocoholic who reads, writes, marketeers and parents. Words and numbers constantly do battle in her head, which keeps her (in)sane while her children do battle under her nose. Has your parenting enthusiasm waned even a little with each subsequent child or just time in general? Care to join me in a little paRANTing and get something off your chest? Link up your favourite post from the past week and then if you get a chance, pop around and say hello to some of the other lovely linkers. The Weekend Rewind blog hopping party starts every Friday night at 8pm and links will close on Sunday night at midnight. Link up here or over on Bron's blog (Maxabella Loves), Sonia's blog (Sonia Styling) or Kelly's at A Life Less Frantic. It does not matter where you link as your link will show up in all 4 places. DO NOT JUDGE ME or Anyone Else For That Matter! Pretty Purrrrfect and Uber Tempting!